Daily Illuminator: When Armageddon Comes Along, You Must Trumpet! September 20, 2011: When Armageddon Comes Along, You Must Trumpet! If you've an angel or demon in the In Nomine setting, you're probably keeping an ear out for the slightest hint of the harbinger of end times -- the final trumpet. IT'S HERE! IT'S HERE! TOOT! TOOT! TOOOOOOOOOOOT! 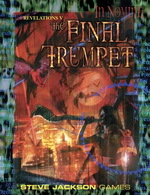 More specifically, In Nomine: The Final Trumpet -- the climactic finale of the Revelations cycle. Half of this supplement is devoted to the titular adventure, where the six remaining blasts of the trumpet herald the end of days. With the heroes caught between Ragnarok and a hard place, can they uncover the celestial schemes and put things right? This supplement also includes expanded write-ups for the Archangels Michael and Khalid, as well as the Demon Princes Baal, Kobal, Malphas, and Magog. Learn of their plots, politics, and powers -- as well as a sample tether for each one. With In Nomine: The Final Trumpet, the epic world of In Nomine sees the cataclysmic conclusion of its greatest adventure. This is the way the world ends -- not with a gong but a trumpet.